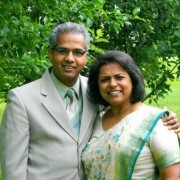 Pastor Finney Abraham was born and brought up in a Pentecostal family in Kerala, India. Later in 1975 as a teenager he came to the United States. He holds Bachelor of Science degree in Engineering, Master of Theology, and Doctoral degree in Religious Education. He served as an associate pastor at Roseville Evangelistic Church for 2 years in Roseville, Michigan. He is blessed with his wife Molly and children Tina and John.